Snakes Ladders Tic Tac Toe In Tin Box combines two classic games in a sturdy colourful tin box. 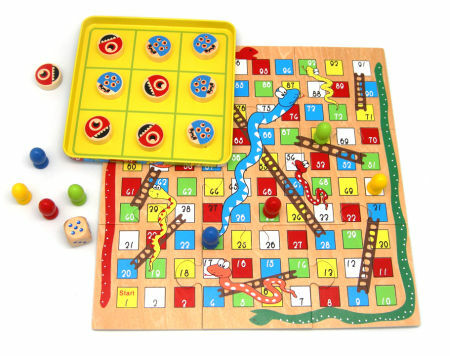 Snakes and ladders comes as a series of puzzle pieces which need to be put together to form the board. Noughts and Crosses sometime called Tic Tak Toe is played in the up turned tin lid with the added benefit of the lids sides keeping the pieces from falling on the floor. Very well thought out this is a great travel game for everyone and a great way to help with counting. We like this because: "Simple design ideal for travelling."